Warhammer 40k 8th Edition – one week to go! There’s only one week left before we get the new edition of Warhammer 40k, and I’m getting so very excited it’s untrue! I’ve been looking forward to the new edition since I knew for sure it was going to be A Thing, and now I think I’m getting into overdrive! It feels like not only is the game being given a nice, clean facelift, but also we’re getting a lot of story advancement, which is leaving me with the overwhelming sense of the newness of the setting. 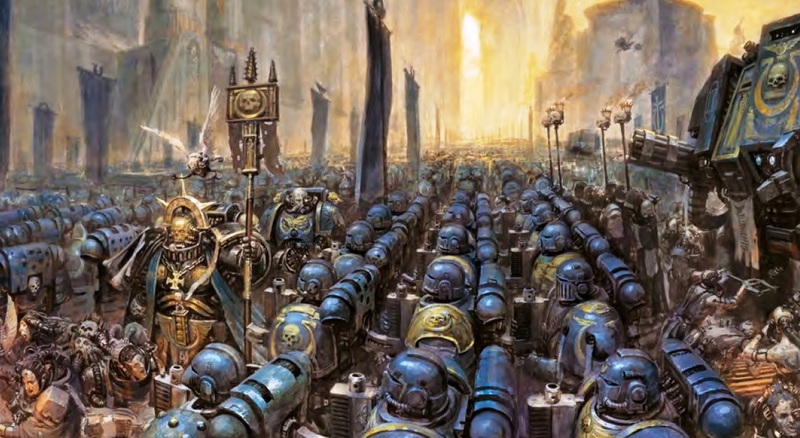 While there have been plenty of dissenting voices about some of the new lore, mainly since some of the articles being put up on the Warhammer Community site, but I think splitting the galaxy in two could lead to some wonderful storytelling opportunities. I’ve heard some people compare it to the split of the Roman empire but, personally, I think it feels more akin to the Iron Curtain in postwar Europe, with the Imperium under Guilliman analogous to the west, and the Imperium Nihilus akin to the east. It would be really cool if this is the direction they take it, of course, but who knows what will happen?! The fact that Phil Kelly says they’re going to expand further on this has also gotten me excited, and I’m left thinking that perhaps we’re in for more Gathering Storm-style events, perhaps with triumvirate boxes to accompany them. I think it’s a fairly safe bet that we’re getting Mortarion within a matter of weeks, so maybe he’ll be coming with some pox-friends? The 40k universe has always been so rich and vibrant, and flicking through my Deathwatch RPG books this morning has really reminded me of that quite strongly. The idea of being able to explore this in a more focused and story-driven manner is incredibly exciting, and while the Horus Heresy series has been a bit of a lumbering juggernaut at times, at its best the series is just truly phenomenal! If they can capture the best of that and bring it into the 41st millennium, then I think I’ll be an over-excited chap for a long time to come! So, if you have a local gaming store near you, or you’ve been paying attention to the internet lately, you’ve no doubt now had a chance to take a look at these new Indexes and so forth. 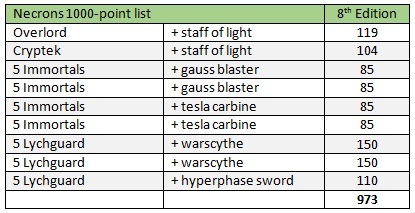 Last week I talked about the changes between a 1000-point list made in 7th edition and its 8th edition updates, but today I thought I’d share with you a basic 1000-point Newhammer Necron list that I’ve put together. My local store is holding a casual 1000-point tournament on launch day, which I’m not sure about getting to yet, but hope to be able to go along and try out the new edition. I think this is a very “safe” list, not using too many fancy units or any potentially confusing things, so I have no idea how competitive it could be. 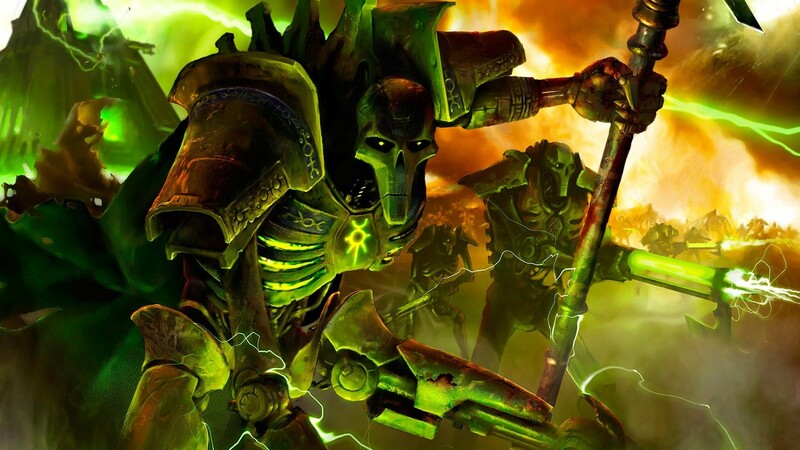 A lot of people have been bemoaning the fact that Necrons seem to have been nerfed by the new edition, but I think that’s predominantly since the loss of the decurion detachment, which I never ran anyway, so I don’t foresee any tears or tantrums here! It’s a simple thing, as I said, but I think I want to start off simple and build up my game from there! I’ve currently got the Immortals and Lychguard at minimum squad size, but due to the change in Reanimation Protocols (rolling to restore a model to the unit rather than rolling as an additional save), it might be worth bunching them up into bigger squads. I’m actually surprised at how close the points are for Immortals here to their 7th edition versions, which suggests to me that they were pretty balanced before! I’ve built up most of my Immortals with gauss blasters, and I think I only have one unit with tesla carbines, so I need to get a second built shortly. Tesla seems to be the thing for Necrons in 8th, with rolls of 6 causing three hits rather than one. I still like the gauss for AP-2, and the way I roll dice, I don’t think I’ll ever get maximum use out of the tesla. But it is still causing me to want to get that Annihilation Barge finished off!! I’ve been trying to re-do some of my original Necrons since January, also. They were among the first miniatures I’d ever painted and, while playing a game last November, I felt they were really showing their age. It’s something I’ve talked about before, of course! In January, I stripped ten Lychguard and have been slowly getting paint back on them – hopefully I’ll have a Necrons update blog soon, where I can show off some of the things I’ve been painting here!